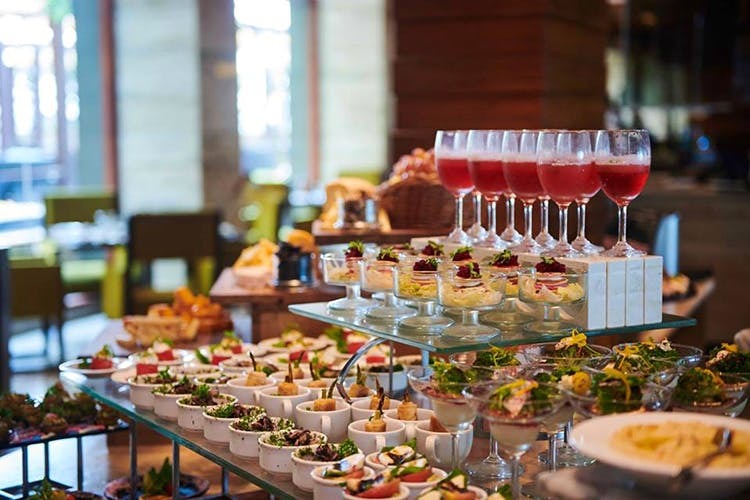 The Hilton’s Bingeful Sunday Brunch at Vasco’s is one of the best Sunday brunches in the city not just for its size and quality but also because of how fun it is. Set high above the surrounding skyline, The Hilton’s Bingeful Sunday Brunch At Vasco’s is hands down one of the best Sunday brunches we’ve been to in the city. For starters, it’s large, so large it spans the entire floor! There’s a whole host of cuisines from Japanese to Mongolian, so much so that we didn’t know where to start. So we figured we’d start with a bottle of wine, post that we picked a plate of our favourite starters and went ham. Steamed chicken dumplings were an instant hit and we followed that up with an assortment of bread and hummus. We liked that they aimed to be authentic, from their salmon sashimi using rich fatty cuts of salmon to their slow roasted pork belly being slow roasted. The food and drink did not disappoint. Speaking of drinks, they have flavoured ice lollies and Hoegaarden beer on tap! However if you’re below drinking age, not to worry they’ve got kids play area along with an entire kids menu that features cute little gingerbread men. The entire atmosphere is just relaxed and the live acoustic music that’s there helps with that too. What’s more, they do theme brunches every month where they do up the entire restaurant; June saw a Disney themed brunch with all Disney stars spread across the restaurant along with a custom new menu that features entirely new preparations. We enjoyed the brunch for not just the food and drink but also the space at Vasco’s offers an amazing view of the city.